The tale of Aladdin and his Lamp is more wonderful then a thousand Arabian nights and now its back with some all new twists. As the evil Abanazar begins his journey to find the boy pure of heart to open the cave Aladdin is busy falling in love with princess Jasmin. When his uncle turns up therefore to offer him the chance to get all the riches he could ever want Aladdin cant refuse. After being led inside the cave by Abanazar he refuses to give him the lamp and so he is trapped inside and left. With some help from the Slave of the Ring and the audience Aladdin rubs the lamp and finds to his amazement a Genie lives in it who can grant anything his heart desires. 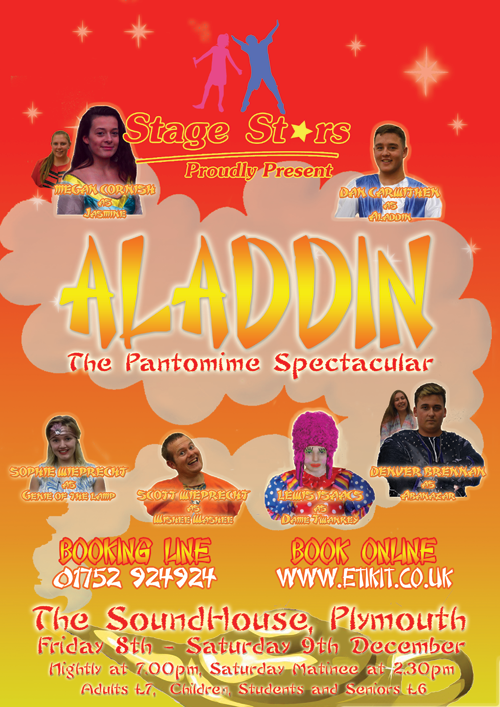 In Act 2 we catch up with Abanazar who begins telling Aladdin's mother Twankey that he has died but Aladdin returns and scares away his eveil uncle. After marrying the princess they move in to their own palace and once Twankey and Wishee have finished their disasterous decoration job and getting very messy Abanazar returns to get the lamp.